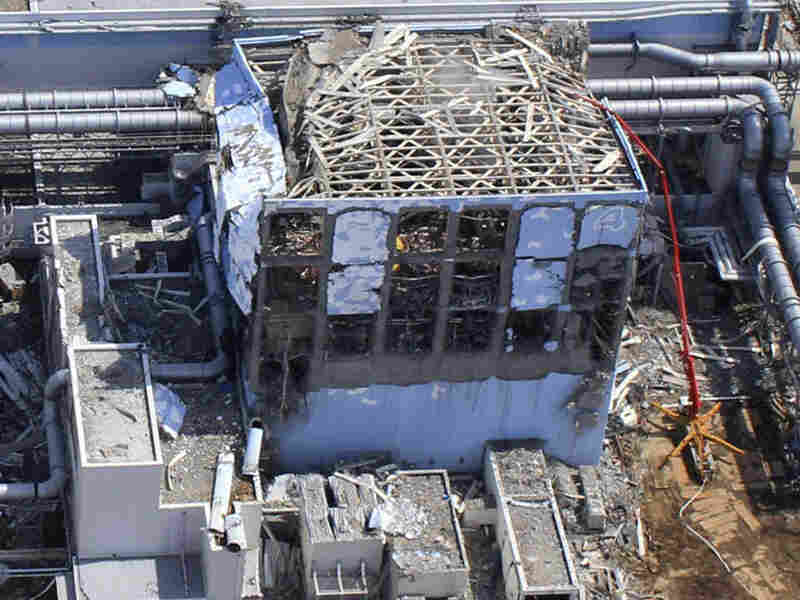 Reports: Trying Conditions, Courageous Acts At Japanese Nuclear Power Plant In new reports, the International Atomic Energy Agency and the Japanese government highlight the hazardous working conditions, lack of communication and last-ditch efforts by workers to contain meltdowns at the Fukushima Dai-ichi nuclear power plant in Japan. Early confusion among the leadership was also a problem. This March 24 aerial photo shows the extent of damage at the Fukushima Dai-ichi nuclear power plant in Japan. 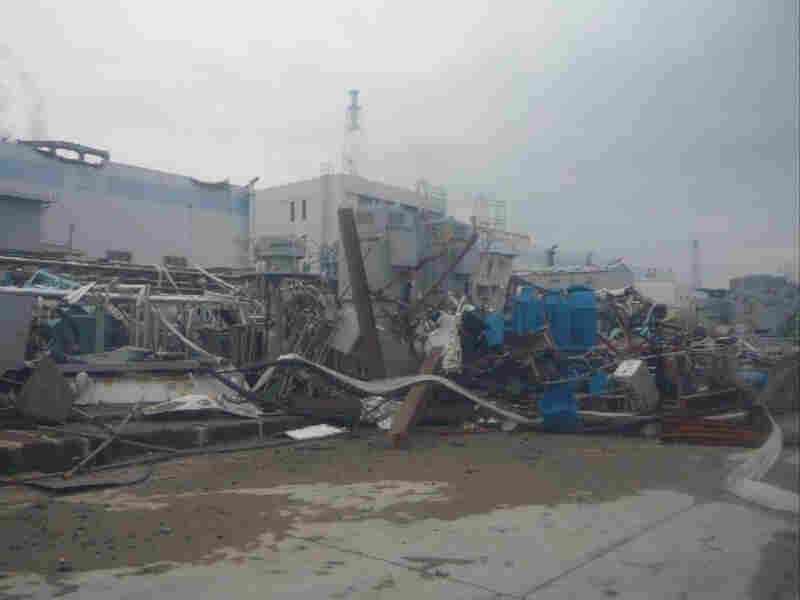 The 40-foot-tall tsunami destroyed the electrical and cooling systems, resulting in meltdowns at some of the reactors. Japanese officials say conditions at the Fukushima Dai-ichi nuclear power plant have markedly improved since the March 11 disaster, but the plant still won't be completely stabilized until early next year. At a meeting of the International Atomic Energy Association in Vienna Monday, officials released two reports that detail what went wrong — and what went right — in the aftermath of the crisis. One report was prepared by the Japanese government for the IAEA, and the other came from an IAEA team that visited Japan in May. Both reports offer a similar narrative of why things fell apart at the plant, NPR's Richard Harris tells Michele Norris. During the initial response, work was conducted in extremely poor conditions, with uncovered manholes and cracks and depressions in the ground. Work at night was conducted in the dark. There were many obstacles blocking access to the road such as debris from the tsunami and rubble that was produced by the explosions. There was also no means of communication between the on-site emergency control center and workers across the site, though there was a phone link to the people in the control rooms. Though the reports praise the staff for courageous attempts to cool the reactors before they melted, the complete loss of electrical power really set them back, Harris says. The earthquake and tsunami knocked down power lines and the massive wave swamped the backup diesel generators. "The backup cooling systems still operated for a few hours, but they eventually ran out of water power, so they went down as well," Harris says. The reports also commended the workers' creativity: from trying to operate valves using a car battery for power to using bottled nitrogen gas to keep valves open, Harris says. In the end they lost the battle — the first reactor started melting within a few hours of the tsunami, and its core was mostly melted and pooling at the bottom of the reactor vessel in about five hours. 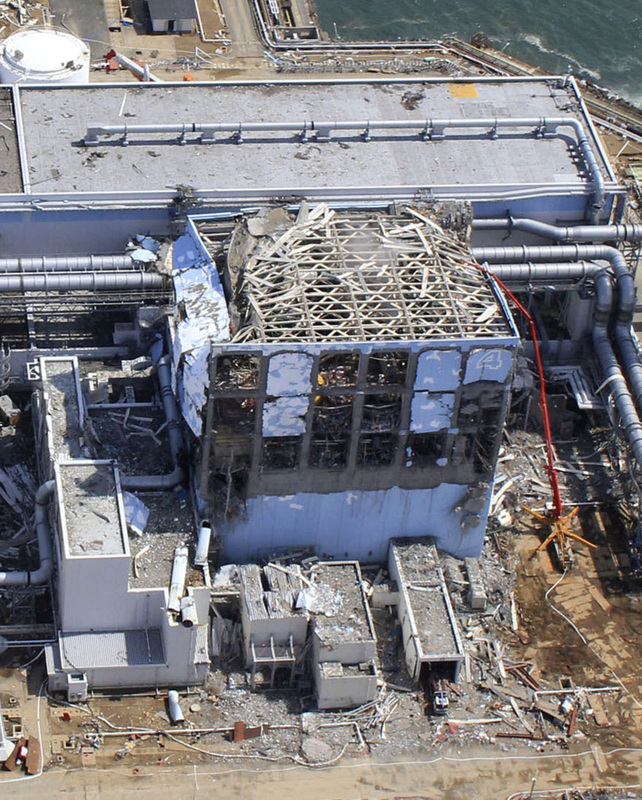 The other two reactors that were in operation at the time of the tsunami also melted down when their backup cooling systems failed in the days that followed. Harris says the reports found that ultimately the Japanese government was most at fault in the handling of the disaster. Early on, there was a great deal of confusion over who actually was in charge: a command center headed by the prime minister or officials at the plant. "It took days to get that sorted out, and during that time there were contradictory orders about what the plant operators should be doing," Harris says. Even so, the report says the managers at the plant seemed to be making good decisions. The IAEA questioned Japan's decision to have some nearby residents stay inside instead of evacuating them altogether, and the Japanese government report acknowledges that they didn't seek enough help from other countries or inform the local community what was going on as well as they could have. After the tsunami water receded, workers were left with a facility completely destroyed. This photo, taken a month after the disaster, on April 11, shows the extent of the damage. The IAEA found about 30 workers who have been exposed to radiation levels that are approaching the government's allowable limit for emergency workers, and it is investigating whether others actually got higher exposures early on. For the general public, Harris says, the Japanese government screened nearly 200,000 people as of the end of May, including about 1,000 children, and the government says no one had been exposed to radiation levels above the government standards. Those standards still could leave some people at increased risk for cancer over the long term, and there could be some additional cases in the population in the future. But it appears that toll from radiation will pale in comparison with the more than 15,000 people who were killed outright by the tsunami.